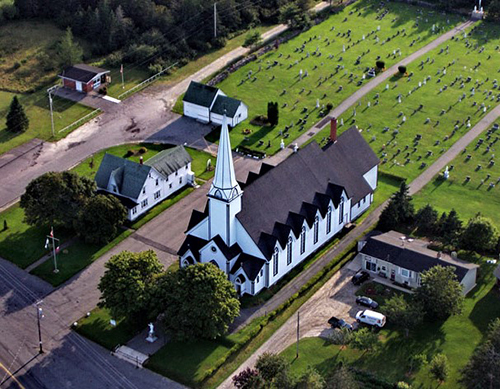 Wherever Acadians settled in post-Deportation Nova Scotia, the Roman Catholic Church was an institution of importance. Typically, the priests and religious sisters were forces for education, economic development, health and welfare, and community cohesiveness. The first church in West Pubnico was completed in 1815. It stood not far from where you are standing, just beyond the boundary of Le Village. It was replaced in 1840 by a new church constructed in the area of the cemetery across the road from the entrance to Le Village. A third church, today’s St. Peter’s, was completed between 1890 and 1892 and is still standing and can be seen from here. As you go into the houses in Le Village you will notice lots of evidence of the Roman Catholic faith in the form of religious imagery, crucifixes and rosaries.